Perhaps it also why I have never been a jersey guy. Meaning I have never owned a piece of clothing with someone else’s name on the back of it. 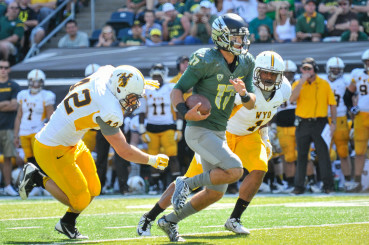 Jeff Lockie will compete to make a name for himself as Oregon QB. Will Jeff Lockie be able to win the starting quarterback position and establish his own credentials without needless comparisons to his predecessor? For example, Does anyone believe comparing Dan Fouts to Marcus Mariota is “fair?” In the Fouts era, there were no scholarship limitations. USC had much more money than the University of Oregon to offer scholarships. Hence they could “afford” to have more quality players. Further, sometimes rule changes make the game different from one generation of players to another. It is no secret that at both the college and pro levels, recent rule changes have favored the offense over the defense. Styles of play also change from one generation to the next. Anyone remember when powerhouse teams ran the Wishbone offense? The phrase will also create an unreasonable expectation of the person who is supposed to follow in the footsteps of the previous legend. I remember growing up hearing multiple times, “Pity the head basketball coach at UCLA who follows John Wooden! It is only a matter of time until we are going to hear or read about some Oregon recruit, “He might be the next Marcus Mariota!” Imagine trying to live up to that as an eighteen year-old who has never played a down of college football. Morgan Mahalak will be part of what is expected to be a spirited competition at the quarterback position next season. But probably more than anything else, I often feel players who are not perceived as “stars” get left out of the discussion when this phrase is used, and unfairly so. In recent Oregon Duck history I think there is no better example than former quarterback Darron Thomas. Since he left Oregon, how often have your heard or read, “He might be the next Darron Thomas?” How often do you think you will hear or read that in the future? Darron Thomas is in a class of one, being the only quarterback in the history of football at Oregon to have an undefeated regular season. 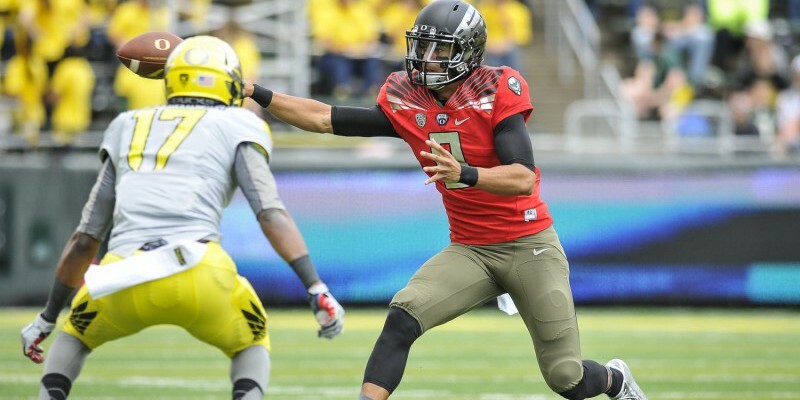 It took Marcus Mariota three tries just to beat Stanford AND win the Pac-12 North Division. Thomas did both in his first year as a starter! 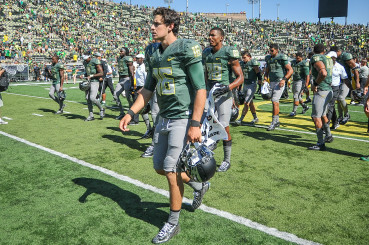 He finished his career at Oregon with a 24-3 record as a starter; two Pac-12 Championships, and led the team to a close but painful loss to Auburn in the National Championship Game on a last second field goal. In that game Oregon set a BCS Championship Game record for team passing yards (374). The following year in the Rose Bowl, Thomas threw for 268 yards and 3 touchdowns in a win over Wisconsin. It has been duly noted that, in the most recent Super Bowl, not one starter for either the Seahawks or the Patriots was a 5-star high school recruit. Not one! Russell Wilson was a 2-star recruit when he signed with North Carolina State. Oregon stars Marcus Mariota, LaMichael James and Kenjon Barner were all 3-star recruits!